You may need to review and update your pricing strategy every few years. Any updates you make might require that you turn off an existing pricing dimension and create a new one. For example, you may have previously priced by Role, but now you have decided to price by Work Experience. This may require you to turn off Role as a pricing dimension and create Work Expereince as a new pricing dimension. Turning off a pricing dimension, regardless if it is out-of-the-box or custom, can be done by setting the Applicable to Cost and Applicable to Sales fields of the Pricing Dimension to No. However, when you do this, you might receive the following error message. 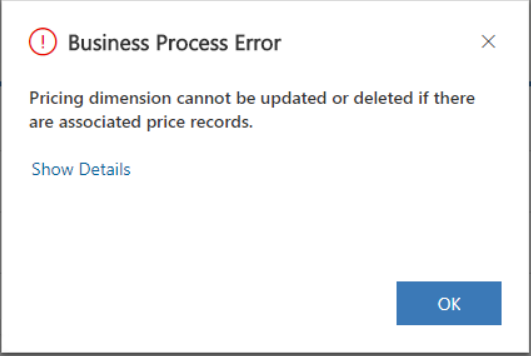 This error message indicates that there are price records that were previously set up for the dimension that is being turned off. All Role Price and Role Price Markup records that refer to a dimension must be deleted before the dimension’s applicability can be to set to No. This rule applies to both out-of-the-box pricing dimensions and any custom pricing dimensions that you may have created. The reason for this validation is because Project Service has a constraint that each Role Price record must have a unique combination of dimensions. For example, on a price list called US Cost Rates 2018, you have the following Role price rows. When you turn off Standard Title as the pricing dimension, and the Project Service pricing engine searches for a price, it will only use the Org Unit value from the input context. If the Org Unit of the input context is “Contoso US”, the result will be non-deterministic because both the rows will match. To avoid this scenario, when you create Role Price records, Project Service validates that the combination of dimensions is unique. If the dimension is turned off after the Role Price records are created, this constraint can be violated. Therefore, it is required that before you turn off a dimension, you delete all Role Price and Role Price Markup rows that have that dimension value populated.